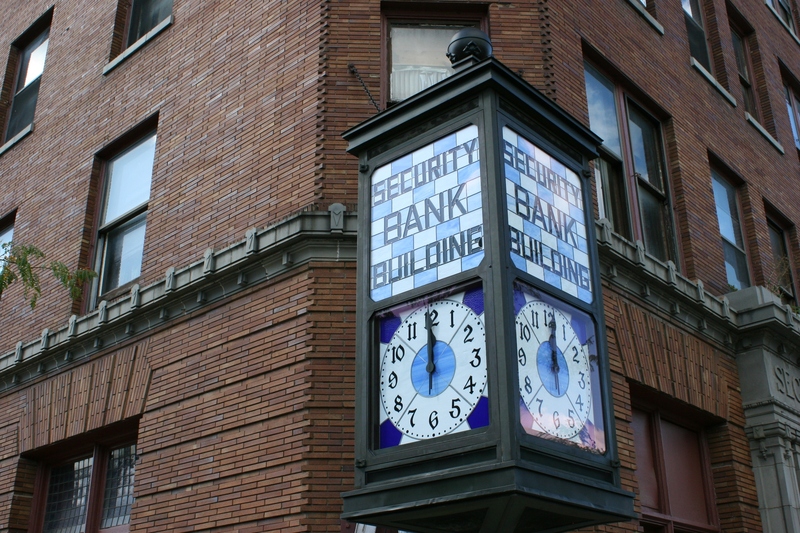 This restored 1915 clock was reinstalled on the Security Bank Building, 302 Central Avenue, on Saturday. This photo was taken Sunday morning. THE TRANSFORMATION IS REMARKABLE, a stunning addition to a busy street corner in the heart of historic downtown Faribault. 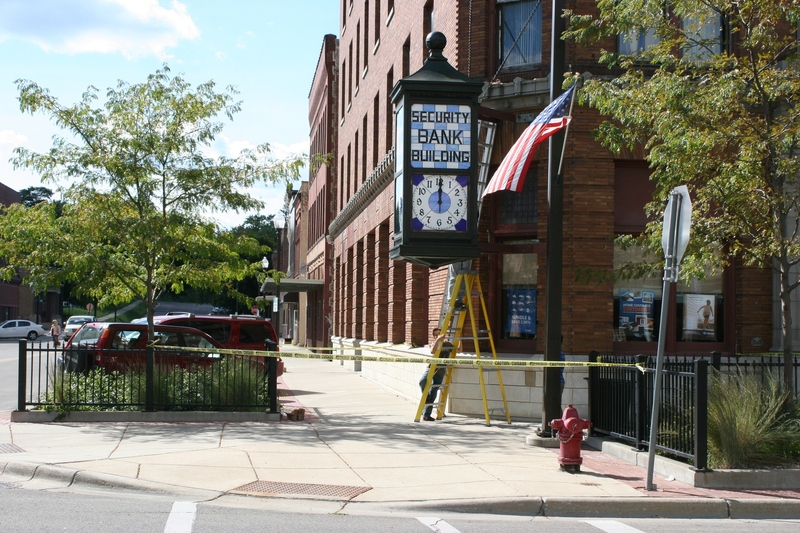 It is the restoration and reinstallation of a 100-year-old clock suspended from the Security Bank building. Clock “doctor” Mike Elwood, whose clock shop is a block away, peers inside the clock. Mike’s son, Charlie, waits at the bottom of the ladder. 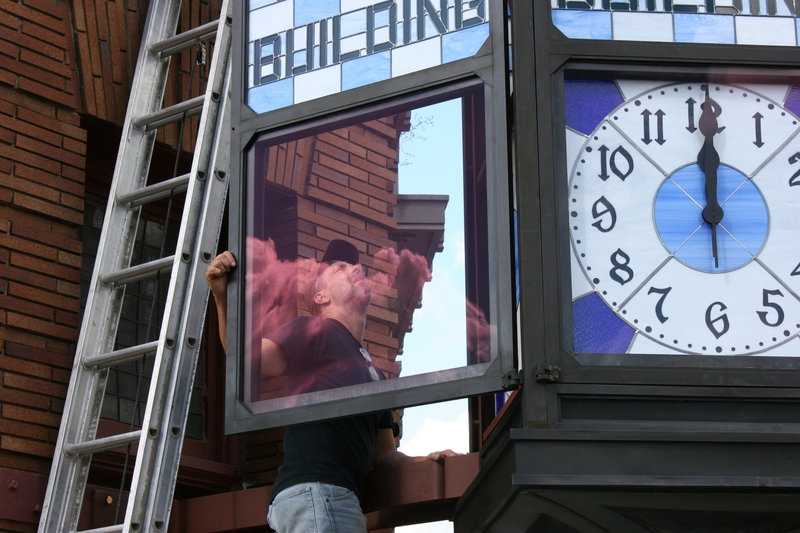 Another view of Mike Elwood working on the clock. Mike’s other son, Tommy, dressed in a Superman shirt, watches his dad at work Saturday afternoon. Saturday afternoon, much to my delight, I spotted Mike Elwood of the Hickory Dickory Doc Clock Shop atop a ladder peering inside the clock. His goal, he shouted down to me, was to get the clock working by the end of the day. 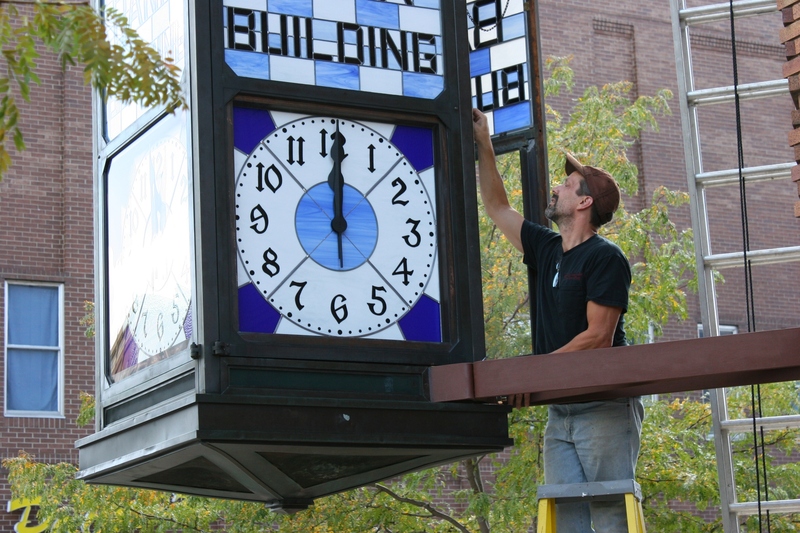 He led the restoration and repair of the clock’s inner workings while Faribault artist Jim Pichner crafted the stained glass clock facing and lettering. The beautiful glowing clock photographed at 9:37 p.m. Saturday. Steve and Peter McDonough admire the clock Saturday evening. 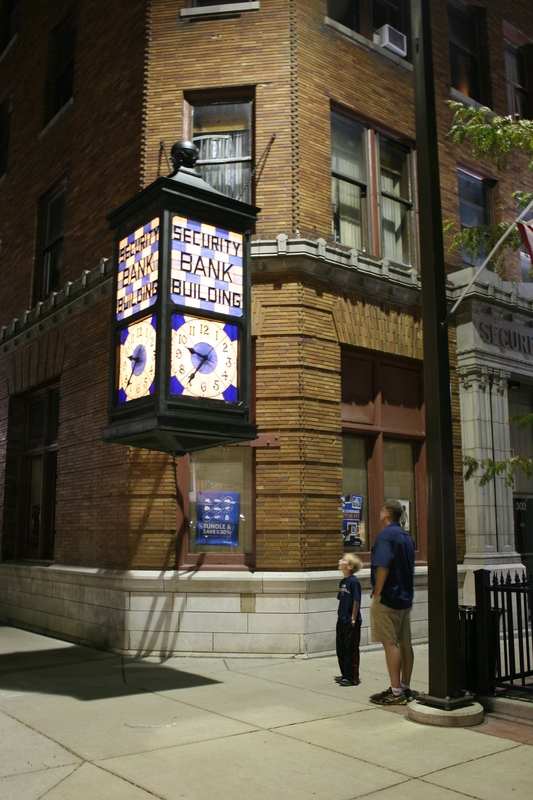 When I checked back at 9:30 p.m., the clock was aglow, working and being admired by Steve McDonough and his son, Peter. Like me, they were transfixed by its beauty. Steve, who owns the Village Family Theater several blocks away, says he loves his hometown’s downtown. Although I didn’t grow up here, I’ve lived here 33 years and also hold a deep appreciation for historic downtown Faribault. The refurbished clock is just one more example of how much this community values history and its downtown. The clock before the restoration. Minnesota Prairie Roots file photo 2011. 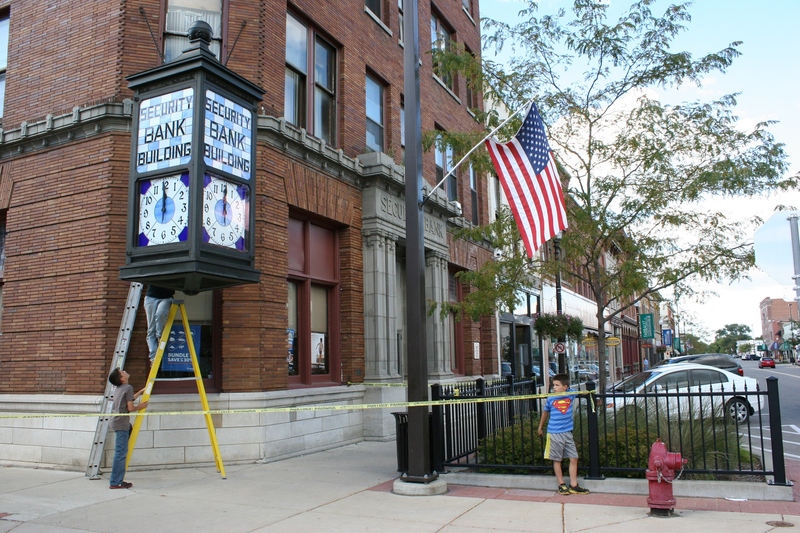 The late Al Burkhartzmeyer, second-generation co-owner of Burkhartzmeyer Shoes a block to the south of the Security Bank building, was instrumental in efforts to get the clock refurbished. After his death in 2012, all memorial funds given in his honor went toward the clock restoration fund. The Faribault Rotary Club, of which Al was a member, also worked hard to raise monies for the project. The city of Faribault provided additional funds to get the restoration going with the stipulation that the Rotary repay those monies. 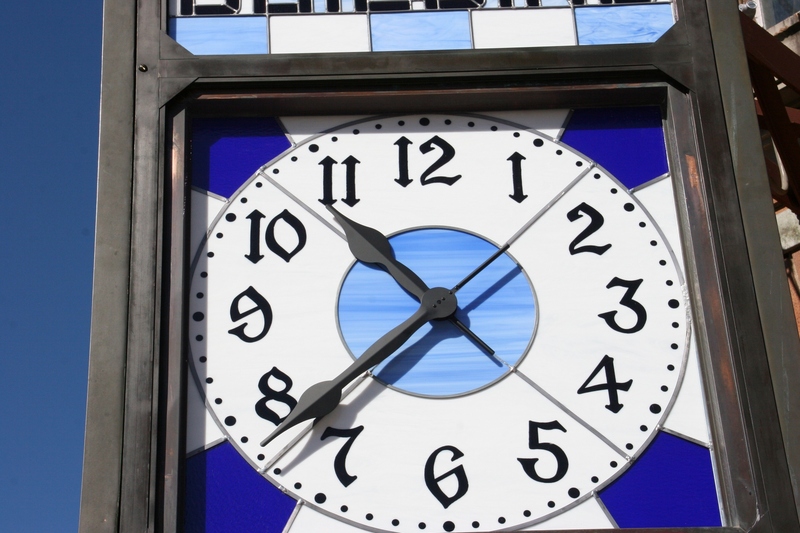 Clock ownership remains with the city. 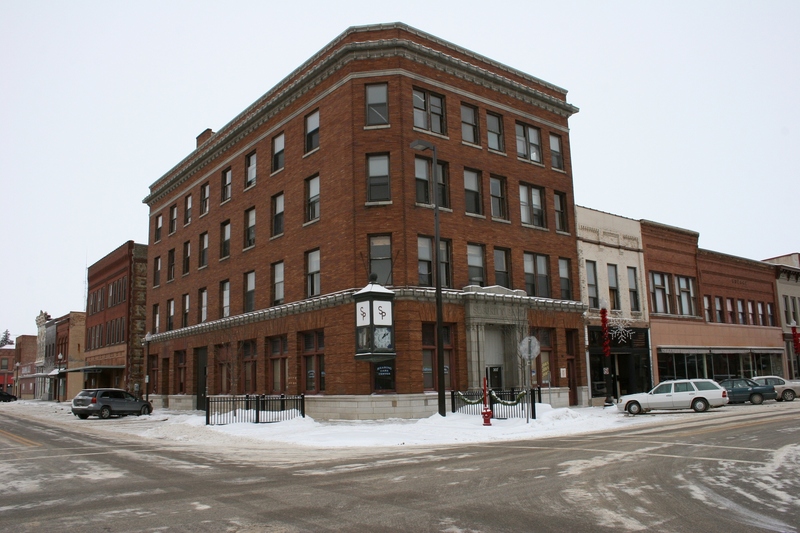 Truly, this was a community effort to raise the $25,000-plus to restore what is now a beautiful piece of working historical art in the heart of historic downtown Faribault. 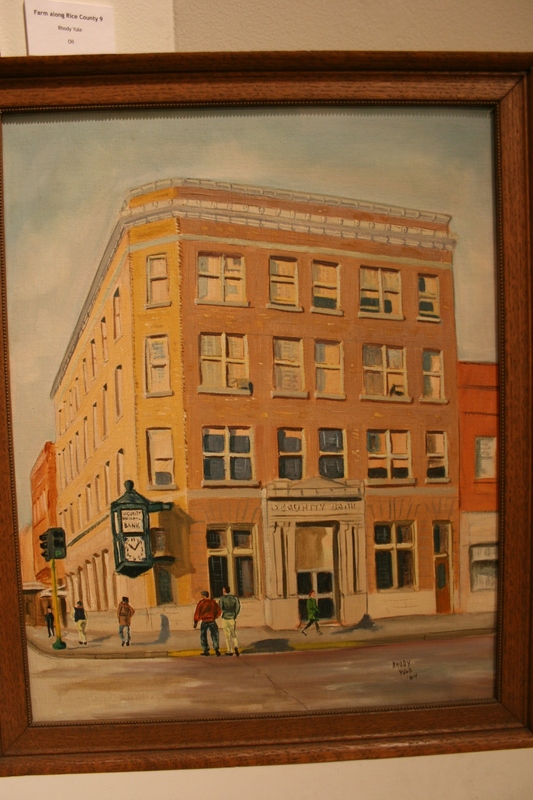 A 1964 painting of the Security Bank by Faribault artist Rhody Yule. The clock was restored to the 1950s era. Minnesota Prairie Roots file photo. 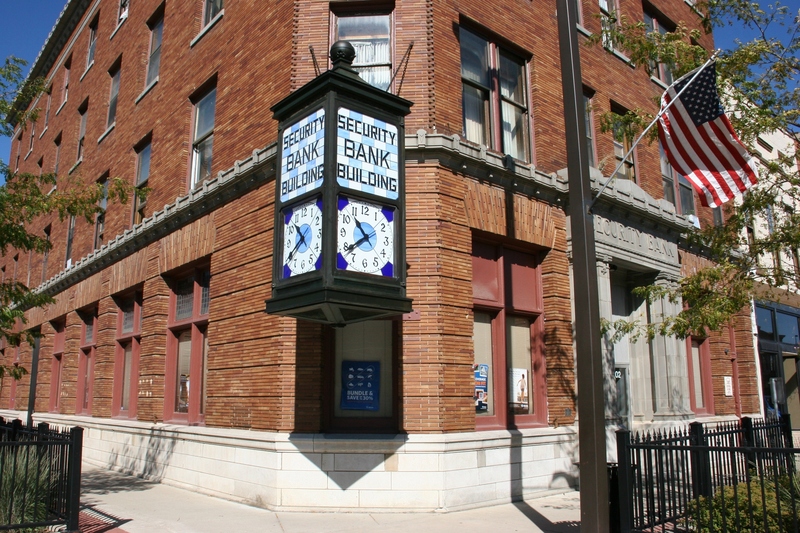 The former Security Bank, photographed in December 2011. Minnesota Prairie Roots file photo. 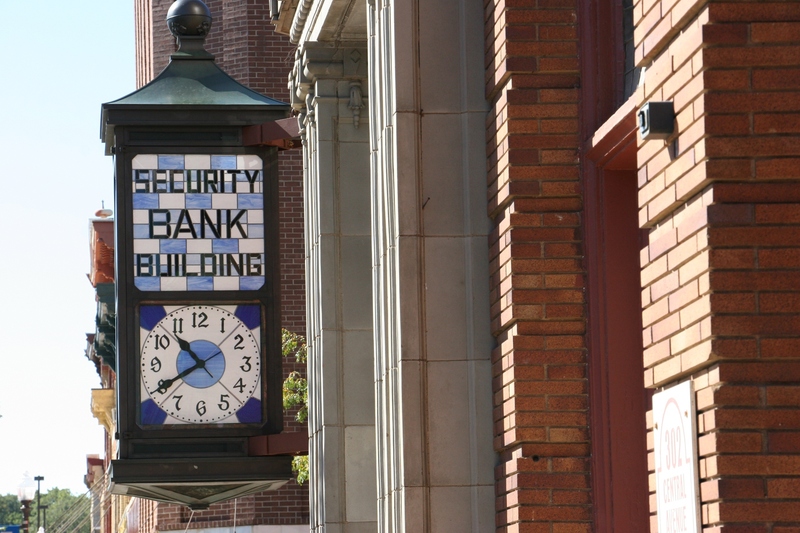 UPDATE, SEPTEMBER 18: The renovated clock will be dedicated at 6:15 p.m. on Tuesday, September 22, at the Security Bank Building site on the corner of Central Avenue and Third Street. The Faribault Rotary Club and Faribault City Council are co-hosting the event. 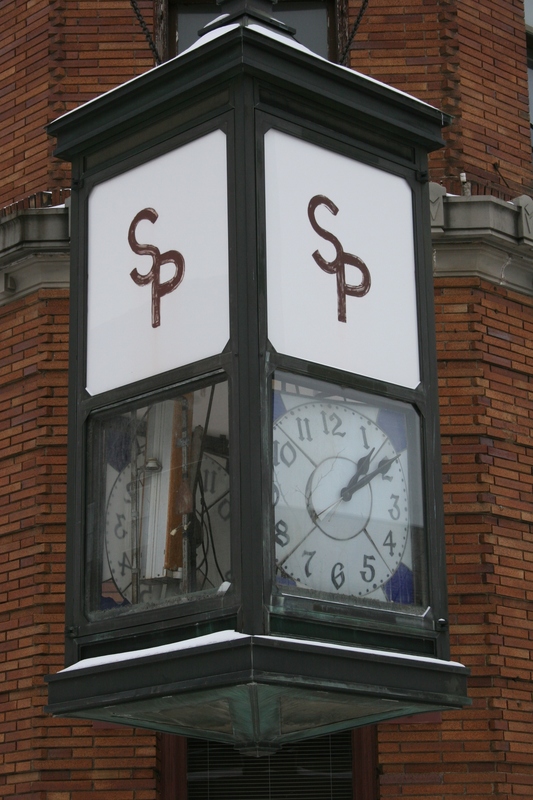 What a great restoration job they did on this and I am sure that the community will all be excited to see how this clock keeps Faribault moving forward while remembering the past at the same time. Massive, stately, functional, & beautiful. Definitely all of those adjectives. Great fund raising effort and wonderful restoration. I prefer this over digital clocks. Beautiful restoration. How is the exterior protected from wind and hail? Me being a weather bug, I was curious how this beautiful piece might stand up to some of your crazy weather? Glass over the clock face. I will need to look again at the top part with the lettering. Good question. But I am confident the clock will hold up during our harsh Minnesota winters. It never fails to amaze me how you can find so many interesting things to write about in Faribault. It is inspires us all to take another look around. Thank you, Greg. I kind of preach that “look at the details” mantra. And in your own backyard. However, I just happened upon this clock installation while heading downtown to buy blue cheese made and aged in caves along the Straight River right here in Faribault. And, bonus, I happened to have my camera with me. Absolutely beautiful! Al Burkhartzmeyer is smiling today. Nice to see a community that is interested in keeping its roots alive and growing. I will take special notice of this clock the next time I pass through Faribault. Yes, I’m sure Al would be pleased. 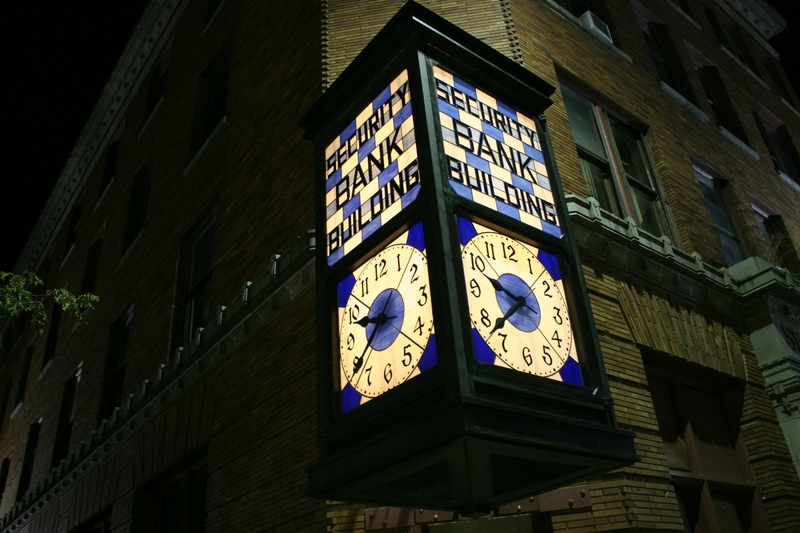 This restored clock is a fabulous addition to downtown Faribault. These clocks are treasures. The right time twice a day, huh? Well, that’s something. I agree. I so appreciate these individuals who can fix and restore such works of art. Hi Audrey! Hope you had a good summer. This is one of the first blog I came to read now that One Minnesota Writer is up and running after my summer hiatus. I love the way the restored clock looks lit up at night! Welcome back to the blogosphere, Kathleen. I’ll pop in and see what you’ve been writing. I’m honored that my blog would be among the first you check out after your hiatus. I thought of you Saturday when I was visiting the daughter and son-in-law in your fair city. Thanks, Audrey! Hope you had a nice visit with the kids. We did, and the son-in-law’s parents, here from California. I agree 100 percent on a job well done on restoring this clock. It’s stunning. It’s a gem, for sure.